1970 Walsh Twin fin I 5 ft 4"
Foam blank with blue glueline stringer, Volan glassed with scalloped 2/3 deck patch, scalloped nose patch, fin patch. Puchased Salvation Army Store,Tempe Sydney, 1998. Minor dings. I have no record of this manufacturer, however it displays all the characteristics of a professionally built board of the era. Jim Walsh used to be a woodwork teacher at Narrabeen Boy's High & used to shape knee boards in his garage. He used to shape boards for us & glass them, the whole bit, till the government clamped down on him about 'hobby businesses'. In fact, Simon Anderson's first few boards were shaped by Jim. The twin fin you have displayed (# 71) is one of the ones Jim designed & shaped & glassed in his garage at Elanora, where he still lives. 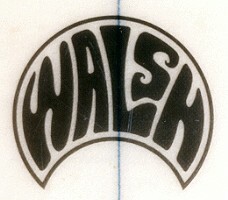 Over the years Jim shaped a lot of 'Walsh' boards & knee boards. 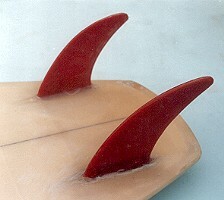 We used to spent lots of time discussing rail & bottom shapes as well as fin design. Glenn is still a surf nazi & will gladly spend hours discussing his theories of board design. He is still the only guy, besides the pros who would get a new board every few months, much to the delight & frustration of Simon, who shapes them for him. The US design (Corky Carroll, Mike Eaton , Rolf Aurness and David Nuuhiwa) was directly imported by Tom Hoyle to Bennett Surfboards, Brookvale in late 1970. Concurrently, Terry Fitzgerald and Greg Hodges "built two five-sixes" from design details culled from negotiations between Shane Surfboards and Corky Carroll, post Johanna World Contest, 1970 (M.3). 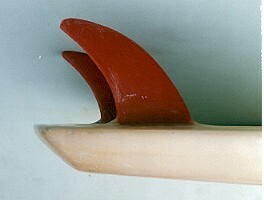 The design quickly dominated 50% of the Sydney market, notably McCoy Surfboards. Usually sub 6 ft x 20" with 10" diamond pod. Glue line stringer. Fin size, shape and placement varied. #134 Farrelly 6 ft 1"
Noted July 2005 : 5 ft 6'' McCoy Twin Fin, 1971 : Fin Specifications - 5 1/4'' x 3 1/2'' base x 6'' span @ 5''. Toed in but not tipped out. Symmetric foil. 1.Nat's History 0f Surfing page 106. 1. Tracks Magazine Number 2 Summer 1970? Twin fin articles featuring Tom Hoye at Bennett Surfboards and Terry Fitgerald at Shane Surfboards. Photographs from these articles reproduced in Nat Young's History of Surfing, page 106. See 1 above. Inexplicably these articles did not appear in The Best of Tracks (Volume 1) design section. in The Australian Surfers Journal Vol 1 # 2 Autumn 1999 page 28 - 45. - cover shot of Terry Fitzgerald (Shane Surfboards), Mark Warren (McCoy Surfboards) and tails/fins.